Down blend cushions add comfort to the casual, cottage style of the Lahoya collection. Sophisication still shows with welt cord trim, rolled arms, and the crisp skirts at the base of the sofa, chair, loveseat (not shown), and Queen sleeper sofa (not shown). The inviting style of the Lahoya collection creates a room for living; Somewhere where you can truly relax with friends and family. 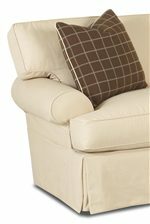 Optional slipcovers available for all of the Lahoya items add versatility and ease of cleaning when used with your furniture. Browse other items in the Lahoya collection from AHFA in the area.